The next day 27th Dec 2018, Thursday, as I was doing the Mahaparayana, I again asked Baba to help her and bring her also in this way to His feet. I finished the Mahaparayan and went to my mobile to post that I had finished reading the allotted chapters. I saw that there had been a call from her. I called her and what she told me made me cry. When I was doing the reading for the Maparayan she was making dosa in her house. She had completely checked if the ring had fallen into the dosa batter. She had put a dosa on the tava, oiled it, turned it over and then served it to her son. Her son while eating exclaimed that there was something shining in the dosa. It was her ring!. When I was doing the Mahaparayana Baba was doing His miracle. She had not seen the ring even when she made the dosa. This cannot be an accident or oversight because when she turned the dosa over she would have heard the sound at least. (Even onions in the batter make it difficult to make a dosa) then how did it happen? Baba's leelas can do anything. Praise be to Baba Our Father, Saviour and a Friend. Om Sai Ram. Be with us always, protect us and make us walk on Your path. Praise be to my Sai. When your friend was busy making the dosa, our dear Baba - our Leeladhar was busy designing another leela of His. His ways are beyond our imagination. So let Baba take the responsibility of the batter of our life and then be rest assured that He will make the most palatable and delicious dosa (best of us a human being) of us for He is The Master Chef or the greatest Chef in the world for our life’s Kitchen and would not allow our batter (this human birth) to go waste! So whom would you allow to make the dosa for you? Yourself or The Best Chef Baba? Lets surrender in total and do our best without expectations and Baba will show His leela. Love You Deva. Jai Jai Ho Sai. Prayers work wonders nd SAIRAAM can only do magic.. I belive in him totally that DEVA will take away all my problems nd show me right path to becomebetter human being. Continue to shower your blessings Baba...Jai Sai Ram! Baba is always with us. 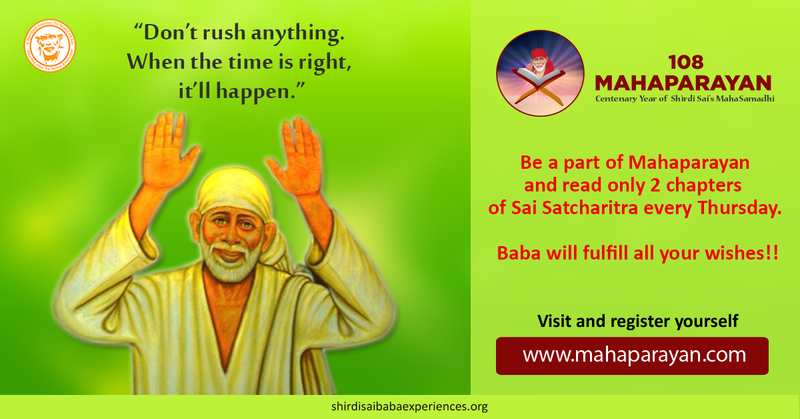 Whenever we have to do anything in our house, we always ask baba first and then do the work .the work always gets completed successfully. Baba has his own ways of doing things. Om sai ram. Baba is always with us. Whenever we have to do anything we always ask baba first and then do the work. The work gets completed successfully always. Baba has his own ways of doing things. Baba may show miracles or not.I know he is with me.May my faith in him never dwindle but give me guidance in life. Om sai ram. You are always there in our life. Sraddha and saboori rest will be Baba's miraculous ways of leelaas.